Let’s see… What have we got in the line-up? A vanilla gourmand? Check. A fougère-type lavender? Check. Tuberose, obviously. Something oudhy and woody for the boys… Rose, ok, done… We’ve added a variation on cologne and a fruity-type tobacco… An oudh and another rose for the Middle-East… Let me see, what are we missing? Looks like we haven’t done jasmine yet! Ok, get me Calice on the line! That “something for everyone” approach is not limited to Kilian (most niche brands do it), and obviously it makes sense to bring some variety to a collection, unless you’re Montale (“There must be an oudh plus something combination we haven’t done yet. C’mon, think harder, Pierre.”) or Les Parfums de Rosine (rose with everything is the brand identity). But filling out the missing slots (“OMG I can’t believe we haven’t done a vetiver yet!”) can feel a little uninspired. Don’t get me wrong: Love and Tears is a good jasmine – Calice Becker couldn’t be bad if she tried, especially with a decent budget to play with. But it doesn’t shed a new light on the flower. Green top notes evocative of lily-of-the-valley and old-style gardenia merge with the green facets of the jasmine sambac, indoles turned down. 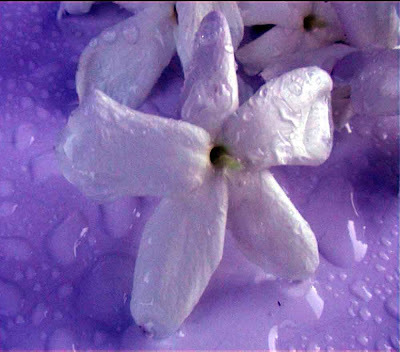 The formula announces jasmine in all its guises – headspace, sambac, Egyptian, “solar”, and even “water jasmine”, and jasmine is pretty much what you get. Have I mentioned jasmine? Then a lactonic, honeyed heart with what feels like a frangipani accord – the notes list ylang-ylang, so that’s the tropical feel, and daffodil, which accounts for the honey -- fleshed out by musk. And an odd, almost metallic feel that creeps up and lasts into the drydown, giving Love and Tears an almost ink-purple hue (or maybe that’s just because it reminds me of the purple-died Serge Lutens Sarrasins in some phases). There aren’t actually floods of jasmine soliflores on the market, probably because as a star player, it’s got so much character the number of variations it offers is somewhat limited. In the niche, Annick Goutal Le Jasmin (ginger-spiked), État Libre d’Orange Jasmin et Cigarette (self-explanatory), Parfumerie Générale Drama Nuui (bitter, green), The Different Company Jasmin de Nuit (spicy) offer quirkier interpretations ; Serge Lutens À la Nuit, a definitive rendition; Maître Parfumeur et Gantier’s super-saturated, almost oily Jasmin, a stunningly vivid rendition I haven’t tested recently, so I don’t know what state it’s in. In the mainstream, you could do worse than seek out Dior J’adore L’absolu, centered on jasmine sambac and a rework by François Demachy of Becker's own J'adore. To sum up, Love and Tears is to jasmine what Beyond Love is to tuberose: beautiful, almost hyper-realistic, but not necessary unless jasmine is to you what tuberose is to me, a note whose every nuance you simply must explore. Note to my readers: You may have noticed I've slowed down the posting. I'm writing like crazy, but for posterity, or at least for something that'll end up on paper, namely my book. Can't do it all, but I'm around! Illustration: Jasmine screensaver from Flower Spirit. These days I'm trying a set of eight By Kilian samples which a dear friend has sent me. So far, I have tried A taste of Heaven and Straight to Heaven. I did not care for the first one, but I loved the second one (specially the opening notes). As you said, I can appreciate the quality of the materials used in the line, but I can't afford any of them. Isa, you know they now sell bottle and atomizer refills now? It's a lot cheaper that it used to be when you needed to get the whole kit and kaboodle. Not being enabling, just saying. I had read something about that refills, but I wrongly thought it was mandatory to buy a regular full bottle before the refill, as other lines do. I am already tantalized by the thought of your book without even knowing the subject, just as I was hooked as soon as I read the words "Duchaufour" and "L'Artisan" here last fall. So I applaud your investing more time in the book even though I do miss the posts. Isa, you'd read right but it's changed a little while ago, thank God. Natalie, who are you gonna believe if you don't believe the captions of the people whose pictures you download at Getty's photo agency? I got tired of looking for a picture, and you're right, that doesn't look like jasmine, does it? Well, Nozknoz, the three new Cartiers and Vero Kern eaux de parfums are making big urchin eyes at me begging to get on with my reviews... and the subject of the book isn't a mystery: it's fragrance (yes, I know, you're shocked). Following Natalie's comment on my original illustration, I've changed it in case you're wondering what we've both going on about. This is now officially a picture of jasmine. Denyse and knoknoz, the oud travel set was a limited edition only available at Bergdorf Goodman NY. Always a sucker for a well done jasmine, even if not ground breaking. Just to thow another one in the hat, the Amouage Jasmine attar oil is utterly enchanting. Hard to quibble with the idea of Calice Becker plus jasmine. I haven't gone head over heels for any of the Kilians yet, but I'm happy to smell them. The quality is obvious, and that's always a pleasure. Scribble away, my friend. I'm clearing a space on the bookshelf just for you. Rebecca, thanks for the info! Silvia, then it's worth checking out. It's a pretty, clean jasmine. Nozknoz, you'll have to wait a little longer for the book though... delayed gratification! I like the Kilians I have tried, particularly Back To Black. As you say, not groundbreaking, but well made. I thought of another niche Jasmine you didn't mention - Nuit Noir by Mona di Orio? It's a bit of a stinker and I know there seem to be quite a few people who don't like her work for some reason, but it is a different take on Jasmine, I think. Michael, I wouldn't have put Nuit Noire in the jasmine soliflores, it's a more complex composition to me. As for Mona di Orio not being liked, you can pin that one on Luca Turin's scathing reviews in The Guide, though I'm sure he'd say the fault lies with Mona di Orio herself! I'm not very familiar with her work, since it stopped being sold in Paris before I really got around to it (I'm a slow tester). I'm also dying to read your book. There is so little really good stuff out there in print. I own as many books (in French and English) as I could find... but most are full-page advertisements with pictures of the bottles... total rip-off. And, meaningful text like... "This scent is for the woman of yesterday, today and tomorrow." Or... "This scent is for the strong woman who can be fragile when she needs to be." Or... "To be worn with a little black dress and pearls." Total BS. As for jasmine, SAs keep sending me over to Bvlgari's Jasmin Noir and it's a total disappointment. I have several samples. First of all, it doesn't smell like jasmine and secondly... after 10 minutes, it doesn't smell like anything at all! I'm going to try this Killian one, though. It sounds like it's worth a trip to the perfume counter. Normand, I'm not sure yet about pictures in my book but at the rate I'm going, there won't be much space for any, and frankly, it won't matter. Funny, I had a lot of problems perceiving Jasmin Noir as well, and I seem to remember it happened also to Robin at NST. Not a good sign. "Think harder, Pierre," really cracked me up - thanks for that! I'm joining everyone else in eagerly awaiting your book. MIWS, count me as another one of the tuberose gang who doesn't do jasmine much, though I adore the note in a composition... Maybe that's why I'm not more sanguine about the Kilian. I thought that The Guide did a good job with those bottle silhouettes... pretty pictures of bottles wouldn't have added much. 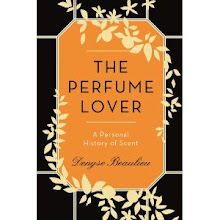 I'm always interested in seeing what the perfumers look like for some reason... but the cliché of the perfumer holding up a series of smelling strips has been hackneyed to death! For me, jasmine is like a rainbow... I love the idea of it, but as I approach it, I don't really know what I like about it. I think it's best used in the orchestra than as the lead. Normand, oh God, yes! Drop those blotters m'am, and step away sloooowly. There's something almost medieval about it though: holding the emblem of your profession in a portrait... But you're right, I love to see what they look like as well. Was recently conversing elsewhere about how frequently jasmine is used in more general compositions; I wonder if that is why fewer folks seek it out individually? Or, conversely, if it just is better -- as Norman said -- as a player in the orchestra, and not a soloist. I happen to be wearing Drama Nuui today. I *wish* it was bitter on me; instead, it always ends up being a warm green, in a nestled in white musk way. The opening doesn't even strike me as particularly bitter. But then, I enjoy being slapped awake by galbanum, and I often make Black Cashmere smell like dessert, so maybe I'm the one at fault. Or I've got a faulty nose. Either way, that's two arrows toward mea culpa. I know what you mean about having one of every major scent in niche lines. I'd probably do it too though. I think some niche brands rely on you really wanting their brand and then giving you a scent you like within it rather than catching you because you adore one particular scent. That said I like these and the presentation is wonderful. Haven't found my 'one' yet though. The book sounds so exciting! congratulations! I was going to email you about your course in London too and haven't got round to it but I shall! Rose, I think you've nailed it: brand identity comes before product, that's the way it goes! And please feel free to contact me about the course, the dates are up on the right-hand side column. I would've killed to get 'bitter/green' from Drama Nuui. In fact, I DID get it - in the little sample that I got from Luckyscent. Then I got the FB. Gack! Muskoliciousness! What happened to the laser-green? oh! and I see you're going to Dubai! Carol Sasich (WAFT by Carol) clued me into a little Dubai house called Malak that does a lovely jasmine soliflore - might be worth your while to investigate if you don't already know it. Anita, isn't that sample vs. FB thing weird? Was it a dab vs. spray thing do you think? Dubai is going to be pretty intensive, don't know when I'll be able to get away since I'll probably take a few meetings on top of the teaching, but I've scheduled an extra day for exploring. It's not exactly in my top ten list of destinations to see before I die, but while I'm there... And I'm sure my students will direct me to interest perfume places. I'm really looking forward to getting to try this one. Though my obsession with tuberose and gardenia remain supreme, this has been the year for me and jasmine, and I find myself pursuing any jasmine soliflore that promises depth. I think spending a month this spring in San Francisco, where fragrant jasmine vines are planted everywhere, is what really kicked it off. Sarrasins has quickly become my go-to for "pure" jasmine, and Neil Morris' Gandhara for "dirty" jasmine ( it really does smell of jasmine and garbage in the best possible way ). That being said, fan-favorites like A La Nuit and its ilk ( too astringent and harsh ) and Jasmin Noir ( Where's the noir? Where's the jasmine? ) have left me cold, so it's tricky to predict just what I'll love. The following words from your review - " Then a lactonic, honeyed heart with what feels like a frangipani accord – the notes list ylang-ylang, so that’s the tropical feel, and daffodil, which accounts for the honey" - really spiked my interest as that could be a description of the drydown of one of my all-time favorites, CdG's Champaca. Part of me is hoping for this to be THE jasmine for me, but I do understand what you mean about redundancy, however. I love tuberose, but for me, Beyond Love was Fracas' prettier but slightly less intellectual sister, and given the price difference and how well represented tuberose already is in my wardrobe, only Fracas is going to be bougnt anytime soon. I'll be curious to see if Love and Tears can win a place in my heart separate from Sarrasins and Gandhara. Also - is it just me, or have soliflores made a big mark this year in niche? Nasomatto also released a jasmine soliflore this year, Nuda, and there seems to be a small and welcome boom in tuberose, too. Last but not least, good luck with the book! You are my favorite writer on fragrance, and I'd love for your voice on fragrance to be heard by more than just the internet fragrance community. Sugandaraja, L&T is definitely less animalic than either of the Lutens so it might fill another slot for you. Oh, I really want to sample this one! 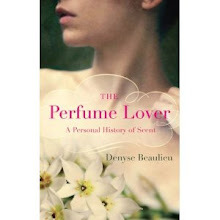 Beyond Love is a real favorite of mine, as I am also a tuberose fan, and I really love jasmine. I recently got hold of some vintage Le Galion Jasmin in two different concentrations, and even the Eau de Cologne is powerfully indolic and just gorgeous. Flora, I'll have to re-test the Le Galion Jasmin I have. I must say I was distracted by the Tubéreuse, which is an astounding prefiguration of Tubéreuse Criminelle, and comes pretty close to Goutal's Tubéreuse Absolue, which means the Le Galion must have contained a hefty dose of the already very costly absolute. Highly recommended if you can find it. Finally got around to trying this recently. I was expecting to be underwhelmed, but preparing for the worst, I found I really, really enjoyed it. It's no-where near as "thick" as things like the Lutens jasmines, but it's not trite as I've found other light-weight jasmines to be. It really reminds me of vintage Odalisque in the top notes, before that frag was sheared down by reformulation. You are absolutely spot-on about it being the Beyond Love of jasmines. It didn't turn out to be "THE" jasmine, but it's one I'd love to own among my growing collection of jasmines. Despite the name, this is my "happy" jasmine - jasmine without the broodiness! Just thought I'd drop a note here, as without your review, I wouldn't have thought to search out and sample it. Sugandaraja, L & T is very lovely indeed. I'm thnking I may not have given it all the credit it deserved in my review: it seems to be very well received by connoisseurs, so I'll put my attitude down to a residual wariness about BK and to the fact I'm not a jasmine soliflore person. And you're right, it hasn't got a tearful molecule in its body!